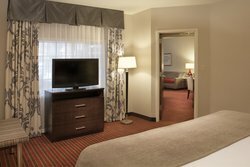 As one of top convention and vacation destinations in the U.S, our hotel rooms in Downtown Indianapolis focus on accommodating both business and leisurely traveler. With our 3-story hotel located in the historic train shed of Indianapolis’ Union Station, guests have a variety of room styles to choose from. Offering Standard, Superior, Executive Rooms, along with Master Suites and unique Train Car accommodations there is a room suitable for each and every one of our guests. 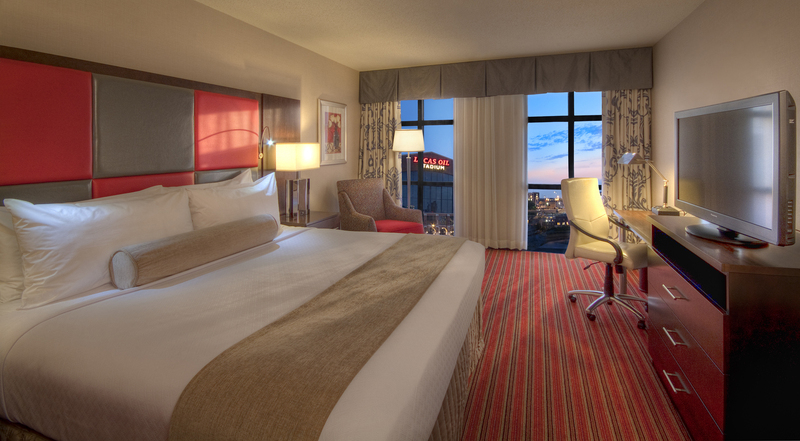 With a variety of room amenities, with some specific to each room style, guests can rest easy after a long day at meetings or exploring the city. Key Room Amenities available in all rooms include Free Wi-Fi, Free Local Calls, Flat-Screen TV, Cable TV, Pay-Per-View-Channels, Room Service, Keurig Coffee Maker, Refrigerator,Toiletries, and a Hair Dryer. 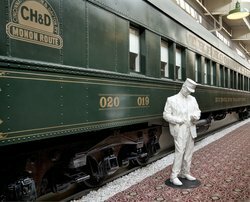 Perfect for the history buff and train enthusiast, our hotel rooms in downtown Indianapolis create an ambiance and unique hotel stay that will create a lasting, memorable, and not to mention, a once in a lifetime experience. 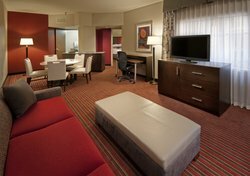 Book with the Crowne Plaza Indianapolis Downtown Union Station today! Perfect for guests looking for a unique experience! This room style features 1 King Bed in a moderately decorated 1920s Pullman train car, 2 chairs, refrigerator, plush headboard with reading lights, and sleep advantage bedding with Temple Spa Relaxation Kit. Also included is free Wi-Fi, charge port station, and wireless printing. Staying with us at Crowne Plaza Indianapolis, offers not only a grandeur experience, but places guests in the historic atmosphere of American’s very first Union Station. For the history buff and train enthusiast, our hotel offers, a history that dates back over 100 years. Guests will be greeted by a variety of “ghost statues” throughout the hotel as they walk in the same footsteps of some of the world’s top influencers and talent. This historic room style places guests right in the original trains that used to steam in and out of Union Station. Offering a unique experience, this 2 Double Bed Pullman Train Car Room also features 2 chairs, a refrigerator, plush headboard with reading lights, and sleep advantage bedding with Temple Spa Relaxation Kit. Free Wi-Fi, free local calls, a charge port station, and wireless printing are also available. With a variety of rooms and suites to choose from our historic train rooms offer an authentic and exciting experience as guests relax and rejuvenate in the original Union Station train cars. Offering both a 1 King Bed and a 2 Double Bed option, the train cars rooms are always a popular choice for those looking to take in the full experience. 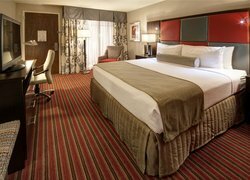 With a variety of rooms in downtown Indianapolis to choose from, this beautifully appointed 1 King Bed room is popular, featuring Sleep advantage bedding and Temple Spa Relaxation Kit. Enjoy an additional headboard with reading lights, chair, and Ottoman, along with charge port station & wireless printing for your business success. Offering 6 different room styles and 2 accessible room types, our Standard accommodations come with the option of 1 King Bed, 2 Queen Beds, 2 Double Beds with both the options of poolside or a view of the city. This poolside room features 1 King Bed, plush headboard with reading lights, and sleep advantage bedding. A chair and Ottoman are also featured for guest comfort. A flat screen TV, refrigerator, and room service are also available. Our 1 Queen Bed Poolside room features 1 Queen Bed with a chair and ottoman, along with a plush headboard with reading lights. Also featured is sleep advantage bedding, and a Temple Spa Relaxation Kit. Includes a charge port station and wireless printing. Perfect for groups, our 2 Double Bed room features thoughtful amenities, including a plush headboard and reading lights, sleep advantage bedding, free room Wi-Fi, free local calls, charge port station, wireless printing, a desk, and executive chair. 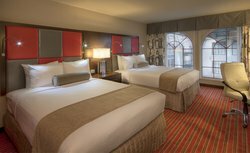 With our 3-story hotel located in the old train shed of Indianapolis’ Union Station, guests have a variety of room styles to choose from. 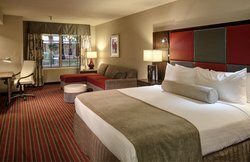 Offering 2 room styles, and 1 ADA room in our Superior room type, guest will have the option of 1 King Bed, or 2 Queen Beds. This cozy room in downtown Indianapolis is poolside facing and features 2 Queen Beds and a plush headboard with reading lights. Guests can rest easy with sleep advantage bedding and a Temple Spa Relaxation Kit. Cable TV, pay-per-view channels, and coffee maker, refrigerator, and microwave are also provided for convenience. Our 2 Queen Bed room style offers guests free Wi-Fi, local calls, cable TV with the option of pay-per-view movies, and room service. Guests can sleep well in our sleep advantage bedding with Temple Spa Relaxation Kit, while staying connected with our in-room charge port and wireless printing options. Our Standard 1 King Bed with mobility access tub features a headboard with reading light and sleep advantage bedding with Temple Spa Relaxation Kit. Also includes a charge port station and wireless printing for your business success. Our accessible 2 Queen Bed room features a visual and audible alarm with doorbell, a desk, executive chair, flat screen cable TV with pay-per-view options, along with comfortable sleep advantage bedding, Temple Bar Relaxation Kit, charge port station, and wireless printing. This beautifully appointed room features 2 Queen Beds, a chair, ottoman, refrigerator, plush headboard with reading lights, cozy bedding, and room service. Free Wi-Fi, charge point station, and wireless printing are also available. This Superior Accessible 2 Queen Bed room features a luxurious headboard and sleep advantage bedding, along with ADA hearing features and a roll in shower. An ottoman, refrigerator, coffee maker, free Wi-Fi, charging port station, and wireless printing are also available. Perfect for guests traveling on business, our 1 King Bed Executive Room features a couch and refrigerator, along with cozy and rest easy sleep advantage bedding, Temple Spa Relaxation Kit, and access to the Executive Lounge. A charge port station, free Wi-Fi, free local calls, and wireless printing are also available. Featuring 1 King bed type and 1 King Accessible Executive room style, guests enjoy an abundance of in-room amenities including, free Wi-Fi, Free Local Calls, Flat-Screen TV, Cable TV, Pay-Per-View-Channels, Room Service, Coffee Maker, Refrigerator, Microwave, Toiletries, and a Hair Dryer. At 400 sq. 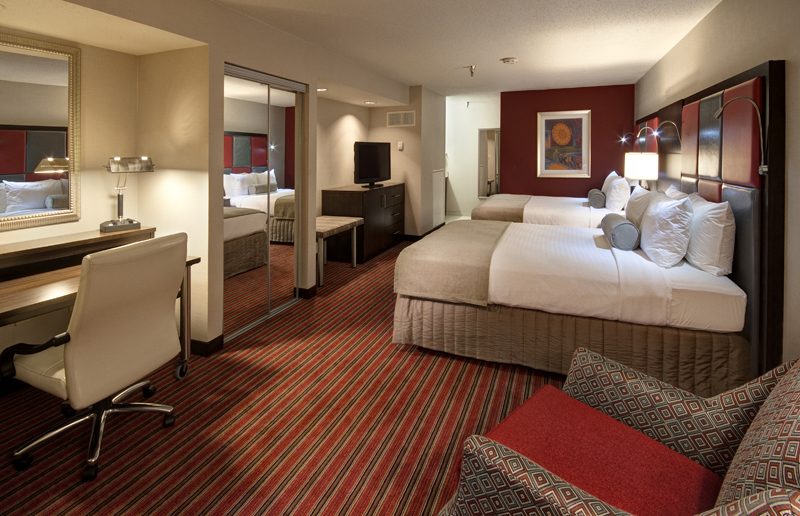 ft., our 1 King Bed Executive room style offers hearing impaired features with full access to a roll-in-shower. Also featured is a couch, refrigerator, charge port station, free Wi-Fi, free local calls, cable TV with pay-per-view movies, a coffee maker, and hair dryer. At 830 sq. 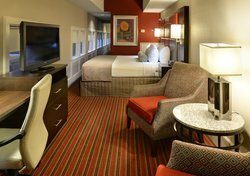 ft., this stunning 2-room suite features 1 King Bed, and a variety of in-room amenities, including luxurious bedding, lush toiletries, free Wi-Fi, free local calls, and room service, guests can easily work or relax in this spacious suite. 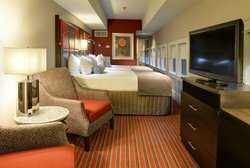 With our 3-story hotel located in the old train shed of Indianapolis’ Union Station, guests have a variety of room styles to choose from including our 1 King Bed 2 Room Master Suite and our ADA 1 King Bed Suite Deluxe. Our 1 King Bed Suite Deluxe style is designed for the hearing impaired, also featuring a roll-in shower for guests who may have additional accessibility needs. Also perfect for smaller groups or couples, additional features include a sitting area with granite tables and chairs, a couch with ottoman, refrigerator, charge port station, and wireless printing.